I rarely do walk-ins but managed to fit this gentleman in and we had a blast. Mata hoata or brilliant eyes, are meant to protect from dangers both physical and mental. This is a profile rendering complete with teeth and koru at the top towards his chest for growth and prosperity in life. a) hope vehine (single) – this single image of the hope vehine is meant to symbolize the twin goddesses of tattoo, give protection and act as an interface for any subsequent piece that is added below it. b) niho – tooth, the two niho at the bottom of this piece are there to protect the entire tattoo. Moving diagonally upwards from left to right, the larger niho with a dark band on the outside is meant to symbolize strength. The final set of niho form the mouth of the mata hoata and act to protect from sin and to also symbolize family. 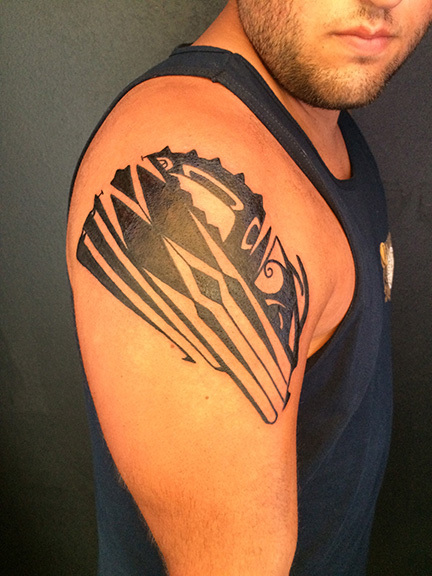 c) ka’ake – upward raised arm, this symbol is meant to symbolize courage and strength. d) puaika – ear, this is the ear of the mata hoata. e) ihu – nose, this is the nose of the mata hoata and symbolizes breath and life. f) mata – eye, this is the eye of the piece and is meant to look out for danger and to protect. g) kape – eyebrow, this is the eyebrow of the piece and is meant to convey, intelligence, beauty and attention. h) koru – unfurling fern head, this symbolizes growth and life as he moves forward. Aloha! Here are some tattoos that I have done over the past few weeks and am finally getting around to posting. I won’t get into too much detail with each one but will give an overview instead, since this is mainly for the tattoo collector to understand the symbols being used. This tattoo was his first and the intention behind it was to mark his life at this point, to pay tribute to his family and to give him strength as he goes forth in life and joins the military. (His skin was barely recovered from a sunburn). He will eventually get a sleeve with this shoulder cap acting as the basis. a) matavau = harpoon: hunter of fish, love of fishing. b) hulu pu’eo = owl feathers (x2): this is for his family aumakua, the owl. c) nalu = wave: love of the sea. d) niho = tooth: protection, protection of the tattoo. e) ka’ake = upraised arm: strength, warrior. g) hena/i’ima = hand; this holds the tattoo to his body. This tattoo of a honu, or turtle was meant to be an overall protective piece, as is the nature of the honu. It is populated with motifs specific to his time and place in life, at the moment. It is symmetrical and so the meaning on one side is reflected on the other. it was finished off with traditional tap tatau. a) pepehipu = pounded, armor: this is an analog to tapa cloth that was used as armor in battle. Here it protects the turtle from attack. b) koru = Unfurling fern head: life, breath, growth. c) niho = tooth: protection, protection of the tattoo. d) kofati = fold/crease: this symbol is a mark of authority. e) mata = eye: to look out for danger, to protect. f) ama kopeka/ ahi = flame/fire: fire or light to illuminate his path as he moves forward. This motif augments ‘g’, as well. g) manu = bird: freedom, flight, direction, home. h) mata hoata = all-seeing eyes: protects from unseen dangers, is also the face of the honu in this case. This chest plate is a continuation of the Polynesian theme that he has going on on the right side of his body. I did not do any of the other work, nor did I do the Borneo rose that this tattoo surrounds. The upper portion was done several weeks before and had not finished healing completely when I went back over some of the areas. This is why some of it appears puffy. a) kofati = crease/fold: symbolizing nobility and connectedness with the earth. b) (twin) koru = Unfurling fern head: life, breath, growth. c) unaunahi = fish scales: symbolizes his love and respect of the sea. d) mata hoata = all-seeing eyes: protects from unseen dangers. In this instance, done in profile with the row of niho acting as the mouth; the upper portion near the rose is the eye. e) ama kopeka/ ahi = flame/fire: fire or light to illuminate his path as he moves forward. f) hena/i’ima = hand; this holds the tattoo to his body. g) hoka = rafter: this rafter motif symbolizes bravery and courage and is populated with etua in Fibonacchi sequence. h) creator etua = gosling: this represents the wearer as a father. i) peka ou mei = protective spirit: protection from evil. j) ka’ake = upraised arm: strength, warrior. 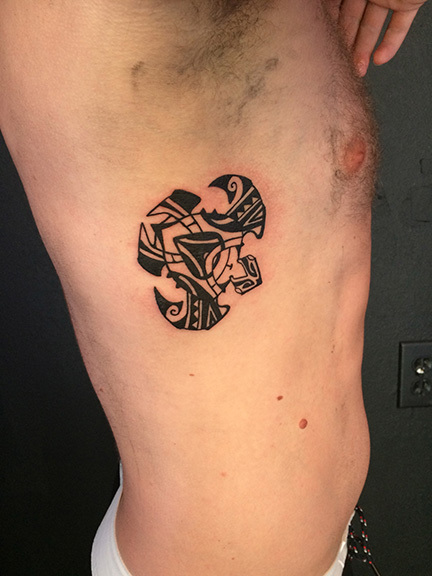 This shoulder cap was his first tattoo and is a unique tiki that overall, displays the image of a star gazing fisherman. This person is an amateur astronomer and came here with the intent to visit Mauna Kea to see the stars. 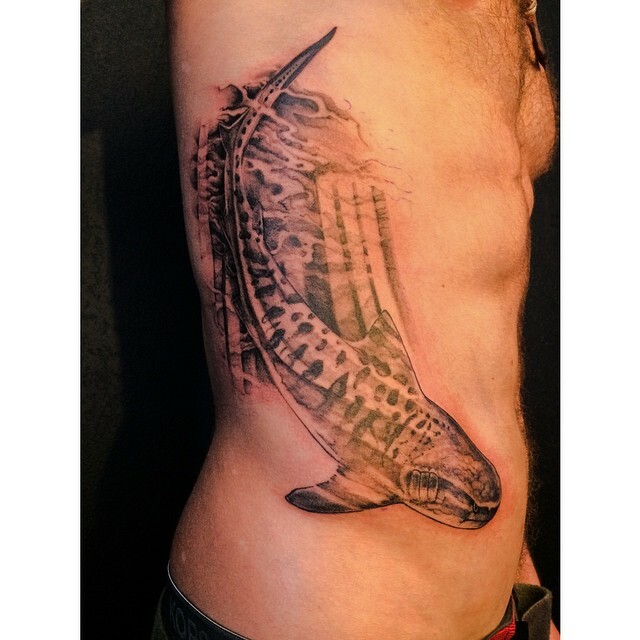 He wanted something to commemorate this, as well as show his love of the sea and fishing in particular. Because the ancient Polynesians utilized the stars to navigate, this all made perfect sense! This is another mirrored image with the symbols on both sides having the same meaning and intent. a) nutu kaha = mouth: power and protection given by ancestors. b) mekau = fish hook: these two hooks, back to back, make up the jawline of the tiki and represent his love of fishing. c) hinenao/pahoe = cherished daughter/ wife: love for the female members of his family. d) hikuhiku tau = bonito (tuna) tails: warrior, speed, to run quickly. e) hena/i’ima = hand; this holds the tattoo to his body. It is also the ears of the tiki. f) mata hoata = all-seeing eyes: protects from unseen dangers, and is also the upward looking eyes of the star gazer. g) ani ata = the sky, the heavens: the heavens, the place where angels dwell, promise, success. This lower shoulder cap is meant to create symmetry from the piece above it (shark aumakua, not done by me) so that we can begin to create a sleeve. The entire piece is family-centric. 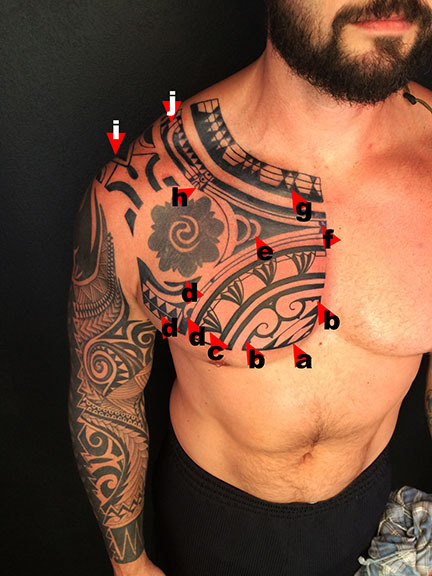 a) pepehipu = pounded tapa cloth: this area is meant as armor and protects the entire tattoo. It is also inset with niho for added strength. 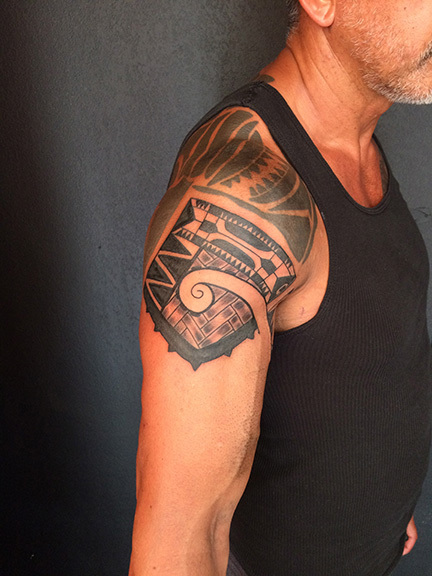 b) lauhala = woven mat analog; family unity; binds the elements in this tattoo. c) koru = Unfurling fern head: life, breath, growth. black d) hiki a tama = cherished child: there are 6 simplified hiki a tama motifs that adorn the koru, each one symbolizing a grandchild. white d) niho = tooth: This motif is an extension of koru/hiki a tama and represents his children. e) niho = tooth: This ties in with the entire ‘g’ motif and represent the years that he and his wife were married (34). f) niho = tooth: This trio of niho represent the holy trinity. 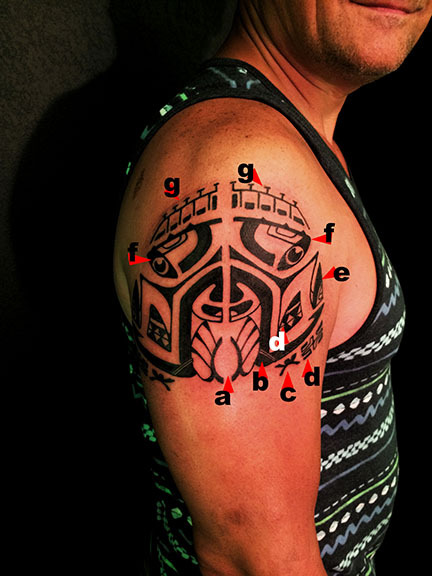 g) itiiti’i/niho = alliance/ teeth: This binding motif represents his marriage to his wife. There are 2 niho; one on each side of the binding that represent him and his wife, respectively. Thank you all for looking and aloha! Aloha! I hope everyone is having a wonderful New Year. 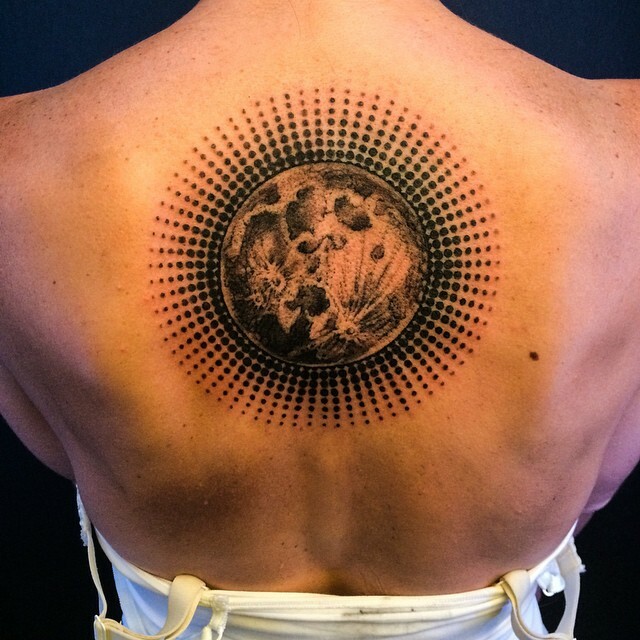 Just wanted to post this pic of an upper back piece that I did last week on one of my regular clients. Full moon with halftones. Enjoy! Did this tiger shark yesterday! It was his first tattoo and he took it well. Will eventually add some Polynesian work around it. Peace!